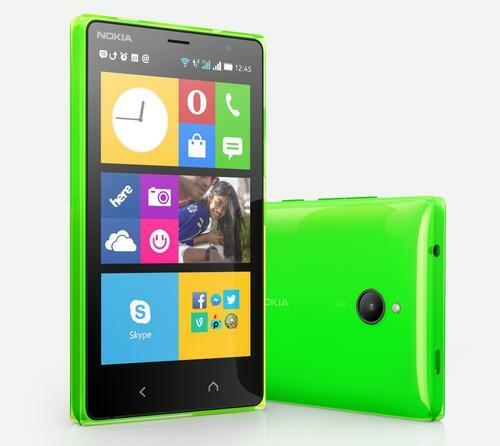 The new Nokia X2 smartphone. The battle for the "next billion users" is heating up with better performance from low-cost phones. The latest contender is the Android-based Nokia X2, which will go head-to-head with the excellent Moto E from Motorola Mobility. The smartphones are powered by a 1.2GHz dual-core Snapdragon 200 processor, which is Qualcomm's entry-level processor. But the Moto E doesn't seem to need more than that to offer snappy performance, which also bodes well for the X2. Part of the reason why the phones don't need a more powerful processor is because neither has a high-resolution screen, so they don't have to handle as many pixels as high-end devices. On paper, the Moto G has a slight edge. Like the X2, it has a 4.3-inch screen, but the resolution is a bit higher at 960 by 540 pixels versus 800 by 480 pixels on the Nokia. The two phones are Android-based, but while the Moto E uses the standard Android user interface, the X2 has an interface that looks a lot like Windows Phone. Another difference is the use of Google's services on the Motorola and Microsoft services such as Outlook.com, Skype and OneDrive on the X2. About 75 percent of Android apps will run on the X2 without any modifications, according to Nokia's developer website. They both have 5-megapixel cameras on the back. If the Moto E has one weakness, it's the camera, especially when taking close-up photos. So here the X2 has a chance to come out on top. It has flash, which the Moto E lacks. The X2 also has a front camera, but the resolution is only 640 by 480 pixels. The X2 is slightly heavier at 150 grams, but slimmer at 11.1 millimeters versus the Moto E's 142 grams and 12.3 millimeters. The surface size of the Nokia device is 121.7 millimeters by 68.3 millimeters compared to 124.8 millimeters by 64.8 millimeters for the Moto E.
The weight of both products highlights the compromises vendors have to make when they develop low-cost phones. For example, the G3 from LG Electronics has a 5.5-inch screen and weighs 149 grams. But in the end that doesn't matter much to me; anything below 150 grams is perfectly manageable. The devices share the same amount of storage: 4GB of integrated storage that can be expanded using a microSD card by up to 32GB. They both also have 1GB of RAM. The Moto E wins this round with a 1,980 mAh battery, while future owners of the X2 have to make do with 1,800 mAh. The Moto E is already available, while the X2 will start shipping in July.